MP 6000 - Fast and efficient! This multi-plane bioptic imager can capture virtually any printed or mobile 1D or 2D bar code in practically any condition, with blazing speed. 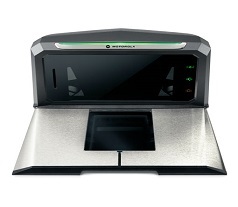 The modular design allows you to add a customer-side scanner for bar codes displayed on mobile phones, traditional loyalty cards or even impulse buys, as well as a handheld scanner and EAS, while providing expandability for future requirements – such as an RFID reader. Resulting in higher throughput and fewer abandoned sales! And a great lasting impression that will foster increased loyalty and return visits.